Jam donut bites or donut holes are a new phenomenon in the UK. Well, I’ve only seen them in Tim Hortons and that’s pretty new and unknown. Let me just get this out of the way straight away, Sam and I LOVE Tim Hortons! Thank you, Canada. Tim bits are the best things in the world and the coffee is so cheap it’s unreal. So I wanted to try my hand at fried donuts but, as you may know, it’s pretty hard to get that perfect round without a machine. So inspired by Tim Bits I have created this jam donut bite recipe. No knead garlic rosemary bread, a super easy to make delicious garlic and rosemary bread. No knead garlic rosemary bread. Okay, I’ll admit it, I’m not a huge bread maker. Because my parents have a bread machine, I’ve never really had the inclination to make my own. I’ve actually always found it difficult to get the bread to rise. Living in the UK I can’t just pop the bread on the counter and expect it to double in size, it’s always far cold. In the past I’ve tried to set the dough on the oven door and leave it there but the side closest to the door always started to cook and the side furthest away didn’t rise. Function of eggs in baking, their many uses and why we use them. Function of eggs in baking. Eggs are a fundamental in baking. They perform a host of different functions in different bakes and it’s important to understand when and why to use them. In the grocery store there are often many verities of egg available, duck, quail and chicken are just a few of the available verities. They also come in many different sizes and it’s important to remember that unless otherwise stated, when a recipe calls for an egg, it means a large chicken egg. This is crucial to remember as buying extra large or small eggs with throw off the ratio of the recipe and won’t yield the desired result. Lemon sour cream donuts, sweet and tart bake at home donuts. Lemon sour cream donuts, the perfect spring treat. With the warmer weather just around the corner my taste buds are beginning to crave lighter, fruitier flavours again. Dense and heavy textures and flavours are best saved for autumn and winter, spring is a time for light airy textures. These lemon donuts made with sour cream are the perfect spring treat. Soft baked lemon donuts topped with a sweet icing and lovingly drizzled with a tart bright yellow icing. A baking guide to raising agents. The basic rule of baking is that if you want your bake to rise, you have to use some kind of raising or leavening agent. As a baker you have a few options to choose from and knowing the type of raising agents available, how they work and how they differ from each other is crucial to getting the best out of your bakes. Raising agents are added to baking mixtures to produce either steam or carbon dioxide. The bubbles add air to the mixture, which is then baked. The air bubbles become locked into the protein structure creating the fluffy crumb we know and love. There are three categories of raising or leavening agent, physical, chemical and biological. I’m going to take you through all of them, explaining how they work and why you need them. Some baked goods count on a big burst of steam to get the rise they need. For example, choux pastry is baked at a high temperature for the first 10 minutes, making them expand due to the quick steam production. This same process is also present when we bake with butter. Butter consists of around 80% fat and 20% water. When baked this water evaporates creating the steam needed to raise you cake. In a cake butter is not enough on its own but in something like puff pastry it is. Butter and pastry are folded and layered together. When baked the steam creates air pockets between the layers of pastry giving you that flaky quality. Fermentation is the process in which yeast cells break down sugar for energy. 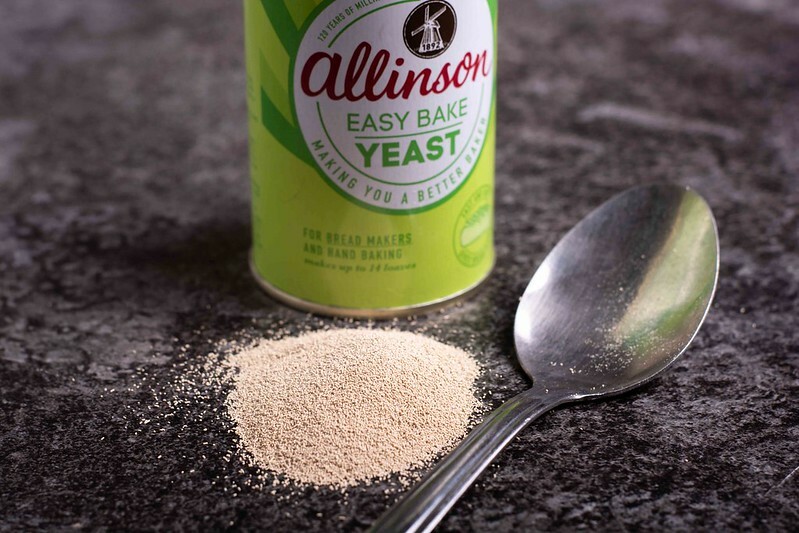 Yeast thrives on simple sugars. As the sugars are metabolized, carbon dioxide and alcohol are released into the bread dough. These bubbles of carbon dioxide are trapped in the protein structure of the bread giving you that beautiful texture. To aid the fermentation of yeast you need to consider some factors. Extreme hot or cold temperature will kill yeast; however, yeast will thrive in a warmer environment. It is best to leave brad to rise in a warm room or proving drawer to work its magic. Salt is a dough retarder, this means that it inhibits the yeast, too much salt in your dough will stop it for rising. Yeast is suitable for all bread doughs including enriched doughs used to make things like Chelsea buns. It is not used in cake making because of its strong distinct flavour. Types of yeast include compressed yeast, active dry yeast and instant yeast. Baking soda, or bicarbonate of soda, or just bicarb to you and me decomposes to form carbon dioxide that produces leavening. If you’ve ever made a baking soda volcano at school you know that when mixed with an acid it goes off like a rocket. Because of this reaction with acid, bicarb is usually used in acidic bakes. On its own baking soda doesn’t produce much lift, but when combined with acidic buttermilk, yoghurt, vinegar or lemon juice it produces that wonderful lift we are looking for. Despite this, very few recipes call for baking soda alone, it is usually used together with baking powder. 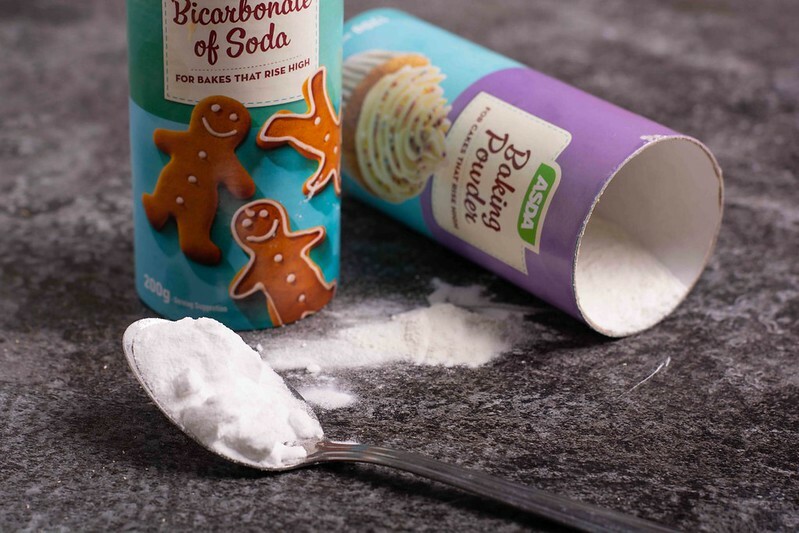 There are however a few recipes that use this, soda bread, scones and red velvet cake all combine baking soda with an acidic ingredient as a raising agent. Baking powders are all made up of the same ingredients: baking soda and cream of tartar. Bicarbonate of soda is alkali and cream of tartar is acidic and the two react with moisture to create bubbles of carbon dioxide. Despite their similarities the two ingredients are not interchangeable in baking. They work in different ways and the recipe will have been tailored to suit either baking powder or baking soda. You can make your own baking powder by mixing 1-part cornstarch, 1-part baking soda and 2 parts cream of tartar. Eggs are technically the fourth type of raising agent, mechanical. For mechanical raising agents to work you have to do something to them. Eggs don’t produce gas, they simply introduce air into the mixture. When we whisk eggs air bubbles form and those air bubbles get trapped in the mixture when we fold them in. This is why we fold in eggs gently so to not lose those precious bubbles. It is this hot air rising that gives the cake the lift. And there you have it my baking guide to raising agents. Let me know if you found this post helpful and if you want to see more technical style posts in the future. For more baking inspiration check out my blog or Pinterest. Coffee mocha cupcakes, rich and indulgent coffee and chocolate cupcakes topped with a rich coffee icing. Coffee mocha cupcakes, the perfect adult cupcake for when you need a sweet pick me up. I love coffee flavoured anything, this is no lie and these cupcakes were inspired by my dark chocolate mocha cake because it went down much a treat. I did however find it difficult to slice and transport when I took it to work to share. Inspired by this I decided to turn the cake into cupcakes for easier sharing and transport. Easy walnut flapjacks. The ultimate easy to make treat. Easy walnut flapjacks. This recipe is super easy, in fact I have no idea why anyone buys flapjacks at all. These delicious treats are great for a high energy snack to pop into lunch boxes or a fantastic on the go breakfast. Flapjacks are a brilliant bake at home option because they are what I call a cupboard raiding recipe. You can throw anything you have into them and they are bound to be brilliant. Chocolate is a good, if not naughty option. Any dried fruit you have in the cupboard works great, I always seem to have goji berries in the cupboard and they pack a great vitamin punch. Any nuts or seeds also work well. Types of fat. If you thought fats only came from meat or seemingly nowhere when you’re trying to dispel it from your middle then you and I need to have a chat. Fats are an essential element in baking giving you texture, flavour and colour all in one. Fats come in all shapes and sizes when it comes to baking and it can be difficult to know what’s best for your bake. In baking gluten is essential, but often we don’t need quite as much gluten as the flour will provide. Fats coat the gluten molecules so they cannot combine into long chains. This is what makes your cake soft and tender not chewy like a bread. It contributes to the fluffiness of your cakes by the air pockets that form when fat is creamed with sugar. Fat also provides flavour and soft mouth-feel. So, you can see that fat is not an ingredient to fear and that it is actually integral to the baking process. Let’s start out with the different qualities of fat and their functions in baking. This will give us a base when looking at the different types of fat. Put simply fats repel water. This shouldn’t come as a surprize if you’ve ever tried to make an oil and vinegar dip for bread, the vinegar will stay in a nice little bubble in the centre of the oil. An emulsifier is needed to combine the two. Like when making mayonnaise we rely on an emulsifier to hold the suspension together. This quality is especially crucial in baking as when the fat coats the gluten molecules no liquid can get to the gluten. If you haven’t checked out my post on flour you should check that out as we go through the formation of gluten. If you’ve ever tasted a pie crust made with all vegetable shortening vs all butter you will know the difference straight away. Different fats taste different and give your bakes a different flavour. The most flavourful fats are butter, lard and olive oil and because of this flavour you have to be careful with which you choose for your bake. Lard for example is great in a savour pie crust but would leave a bad taste in your mouth in a cake. As discussed earlier fat coats protein in flour preventing water coating the proteins and slowing down gluten development. Fat also works to shorten gluten strands. This is why a cinnamon roll and a baguette have different textures. They are both a bread product made with flour and yeast but the cinnamon roll is made with fat whereas the baguette is made without. Like sugar, fat is essential to the rising of cakes. When beaten with sugar air pockets form, supported by the fat. Butter is used in cakes because it also contains water which evaporates when baked, this rising steam creates lift in your cakes. This is more visible when baking puff pastry, layers of butter are folded in-between layers of pastry, when baked this butter melts and evaporates lifting the pastry and creating air pockets. This is what creates the distinctive flakes. Fat traditionally comes in 2 types, liquid and solid. Solid fats can be melted but generally re-solidify in cooler temperatures. This gives solid fats a different function in baking than liquid fats. Shortening is made from 100% vegetable fat and is solid at room temperature. Shortening gives pastry its wonderful flakiness and gives cookies a lighter feel. It also gives bread stability and a nice smooth texture. It is generally advised to use shortening in conjunction with butter because shortening gives your bake no flavour or colour at all. Butter consists of 80% fat and 20% water combined with milk solids. This water content works wonderfully in cakes as the water evaporates helping the cake to rise. As discussed, it is also helpful with pastry as the water evaporates creating air pockets giving your pastry that distinct flakiness. Butter also imparts flavour into your bakes. Clarified butter is butter that has been heated to remove the sediment of milk solids therefore turning a clear colour. It is 100% fat. This means that it can be used as a substitute for any other 100% fat but not butter in baking. It has a rich flavour and beautiful golden colour. Margarine is made from vegetable fat but unlike shortening contains only 80% fat. This means that it can be used instead of butter however it lacks the flavour of butter. If you are trying to cut calorie content, I would recommend using both butter and margarine. Coconut oil, whilst technically a solid at room temperature, coconut oil has a lower melting point than butter. Since it is 100% fat contrary to popular belief, I don’t think it can be substituted for butter in most cases. It simply lacks the water content; this water needs to evaporate to aerate cakes and pastry. Substituting butter for coconut oil produces denser cakes. Lard is traditionally made from pig or cow fat. It can be used in any recipe that calls for vegetable shortening however you need to keep in mind the strong meat flavour. This makes in perfect for use in savoury pastry. Liquid fats do a different job in baking. Since they cannot be creamed with sugar to aerate and don’t contain water to evaporate, we need to think about them differently. Oil does provide fantastic moisture to cakes that are denser and don’t need as much lift. Brownies and carrot cake for example use other raising agents to provide the little lift desired. The desired end product is very moist and oil provides that. Vegetable oils are generally flavourless oils which can be used interchangeably. You may also use sunflower oil. Olive oil is fat obtained from grinding whole olives and extracting the juice. Used in focaccia bread and other Mediterranean savoury bakes. Its strong flavour means it lends itself to savoury bakes and should be used carefully as the flavour can overpower your bake. Can be substituted for vegetable oil. Other nut oils are mostly used to flavour baked not as a primary baking fat. Cocoa butter is a pale yellow, pure, edible vegetable fat extracted from cocoa beans. Used in chocolate chips. Ghee is a type of clarified butter with a subtle yellow colour and rich nutty flavour, used as a substitute for butter in many cultures. Vegetable ghee, made from various vegetable oils, is more commonly used than ghee made from butter. So there you have it my types of fat and how they are used in baking. Let me know in the comments if you find this type of post helpful and if there are any other topics you want me to cover. For more baking 101 inspiration check out my blog or Pinterest. Cadbury Creme Egg cupcakes. Orange flavoured cupcakes topped with a twisted chocolate and orange frosting and a Cadbury Creme Egg. Cadbury Creme Egg cupcakes, the perfect Easter treat! Moist orange flavour cupcakes topped with a swirl of orange white chocolate frosting and dark chocolate ganache. Lovingly finished off with half a Cadbury Creme Egg.